I imagine that when other scientists need to travel for research-related business, they file some paperwork, and then hop on a plane. I only dream that I could do the same. The official rule at my university is that faculty need permission one month before any work-related international travel. Period. Even if the funding is external. And even if it’s okay with your chair and doesn’t interfere with teaching. This rule, in itself, is a massive handicap that puts my research program at a disadvantage. During moments like these, it can feel like my own administration is the enemy of my research program. I know that they everyone is, in fact, quite supportive, at least in spirit. Nonetheless, I’ve had to grow accustomed to an administrative obstacle course. 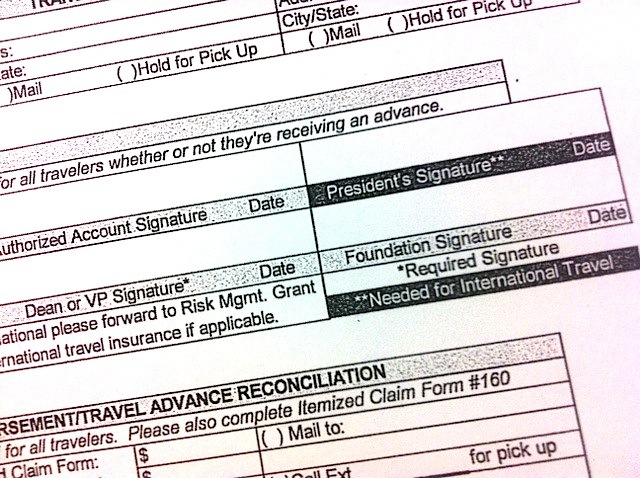 To get travel authorization, I need signatures from a long series of administrators. Before signing, they have a series of questions about budget, insurance, and logistics that require detailed answers before a signature arrives. Sometimes this process has taken a few weeks, and that’s with our departmental admin person chasing the process diligently the whole time (for which I am eternally grateful). There are a few reasons why these questions posed to me are unnecessary, overly silly, and frustrating. First, all of the questions they ask could be easily answered by looking at the text of the grant itself, which was already approved by administration. Second, these administrators are aware that I essentially am doing the same thing every year with the funds, and so nothing changes. If I was approved the year before, what’s wrong with this year? Third, all of these funds are administered by the fiscally independent university Foundation, which operates outside contracts and grants, and technically my administration has no control over these funds and only need to approve my time away from campus. Also, this travel happens off the clock of the academic year, so really the only branch concerned with my time and the funds should be the Foundation. This year, I should note, the process has gone smoother than ever before. It might be because I have the same Provost for two years in a row, which is a new record for me in the past six years. (So far, he’s been a keeper.) Moreover, the Provost’s lead administrative person is the most awesome ever, who used to work in my Dean’s office. Having her there is soothing. (Apparently, she spent an hour on the phone with my equally excellent departmental admin person sorting out technicalities that she was required to attend to.) I just got the signatures last night, and bought the tickets. This time it only took a couple weeks to get permission! I can only take so much solace in the fact that an unnecessary process is less painful than it has been in the past. How hard is it to travel with your university? Are the international travel rules overly onerous? How much of your time have you spent dealing with paperwork that you could have spent on teaching or research? This entry was tagged administration, field research, international travel, R1 vs non-R1, travel. @Sue_Bertram Easy – Issues arise with “employees” like techs or students here on a visa (just complicates other travel). @Sue_Bertram If u send them w gear (have to bring back) or if they have to bring tissues (say u incinerate) just have to cover in letter. Pretty easy to actually travel. No oversight on purchases up front – I have a corporate card that makes travel arrangements easier. On the other, no admin support as I do it all myself. Much more difficult to account day by day expenses for trips that last several weeks! Interesting. More reports would be great. I can understand the delay and precaution involving travel with students. But for any faculty member to give a month’s notice to travel internationally on one’s own? With independent grant money? That’s the annoying part. My state school is similar though it doesn’t seem quite as painful and things can be expedited if necessary. Haven’t done international travel yet so don’t know how painful that will be. I think there’s slack on domestic travel. My forms always get processed pretty easily. I was outraged last year when a physics faculty member needed to get to his collaborative field site in Asia (an accelerator or nuclear apparatus) and his travel was blocked by administration, because he didn’t ask a month in advance. I can’t even imagine how I’d handle this if I was called abroad for an important and legitimate reason but was denied by the university because I didn’t give enough notice. That would be my last straw, I think. Anybody out there, want to test it by inviting me to a seminar in your international locale three weeks from now? 🙂 Somewhere warmer than California would be nice.